I need to make a pedestal for a small meter and panelboard. It will be permanent (at a park). I was thinking of two 2-1/2" galvanized angles in holes (in the ground with concrete) and galvanized kindorf between them. In place of that small panel, look at whay they call an "all in one." Another good choice is to purchase a pre-made pedestal; you might even save some money. Anyway, the pressure-treated post gets set 3ft. down, and a little concrete doesn't hurt. A larger panel would probably benefit from a bacjing board. make sure all holes are plugged, and that you maintain the space between the post and the panel. You need to pipe to a spot under the trailer and set a junction box; make sure the trailer cable can reach! The pipe needs to be 24" down - there's an additional HUD standard, in addition to the NEC. What size service? Look for the nametag on the trailer. Treat the trailer as if it were a big toaster - not like it were a home. You also need a ground rod. If your trench is 30" deep, you can lay the rod in the trench. It is an 100 amp service for a park (a town park). Midwest (midwestelectric.com) has a combination meter chanel / panel that would work. Look at Products / Service Entrance. There is a photo of what would do the trick. Keep in mind the pedestal is a structure, and all subsequent panels will be sub panels and addressed as sub panels. A 4X4 treated post is what I would use for a small one. Two 4x4's with a back board for bigger panels. The concrete posts look like a McDonalds coffee stirrer on top. It is a flat surface about 24x18 cast on the end of a 4x4 concrete pole. They put an "all in one" up on one of those for a trailer disco. Maybe that is just a Florida thing. 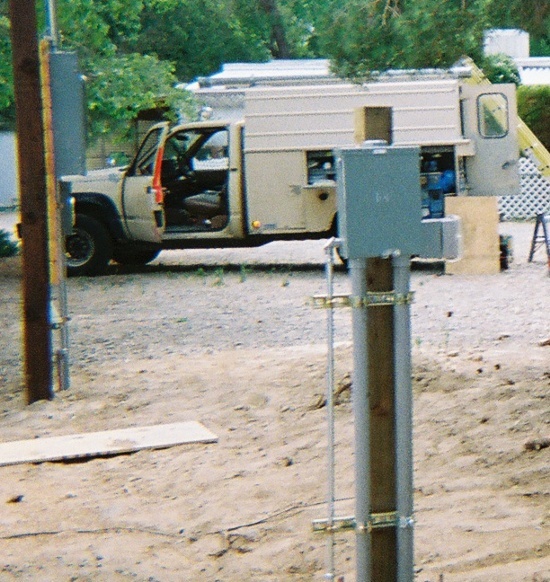 I use metered pedestals. Pacific Utility Products has the USP16-M2100 that has a covered meter and a 12 space panel integrated. You set them on a concrete footer, so there's no need for sticks and exposed conduit, etc. They come in either painted or stainless steel and look 10X better than a 4X4 with a box stuck to it. If it's a permanent installation, why not do it right?